An AFP contributor investigating drug cartels shot to death in Mexico. An American freelance journalist fatally shot while embedded with South Sudan rebels. A blogger in Malta killed in a car bomb after reporting on corruption and cronyism. These were among 18 fallen members of the media whose names were inscribed Monday on the journalists memorial at the Newseum, a Washington museum dedicated to the understanding of the importance of a free press. 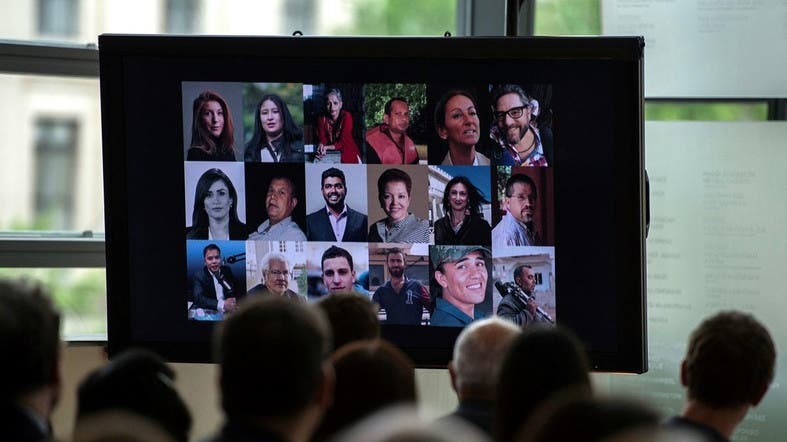 The latest group, including eight women and two freelancers, represents a fraction of the dozens of journalists killed last year on the job but aims to draw public attention to the dangers faced those pursuing the news around the world. The 18 who died “represent the much larger threat to all journalists, who face unprecedented dangers as they strive to provide information about our society, often in countries where press freedom is imperiled or nonexistent,” said Jan Neuharth, chief executive of the Freedom Forum, the parent organization of the Newseum. The memorial wall which was created two decades ago bears the name of more than 2,300 who died in newsgathering since 1835. The latest group honored included Christopher Allen, a 26-year-old US freelancer shot in the head during a battle between the South Sudanese army and rebels. Government officials claimed he was not targeted. Also included was Maltese investigative journalist Daphne Caruana Galizia, killed by a car bomb last October as she lifted the lid on widespread corruption in the Mediterranean country. Added to the wall were two Mexican journalists slain following their investigations of drug cartels: Javier Valdez, the founder of weekly newspaper Riodoce and a longtime AFP contributor, shot outside his offices; and Miroslava Breach, a veteran crime and politics reporter found dead inside her car with gunshot wounds to the head. Holly Williams, a CBS News correspondent who spoke at the ceremony, said those honored showed remarkable bravery in the face of adversity. Others listed on the memorial included Mohamed Abazied, Hawker Faisal Mohammed and Dilshan Ibash (killed in Syria); Shifa Gardi, Arkan Sharifi, Stephane Villeneuve and Veronique Robert (Iraq); Sudip Dutta Bhaumik and Gauri Lankesh (India); Nikolai Andrushchenko (Russia); Yameen Rasheed (Maldives); Maria Efigenia Vasquez Astudillo (Colombia); Kim Wall (Denmark); and Christopher Iban Lozada (Philippines).